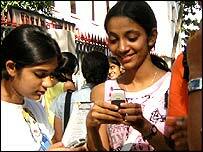 More Indians will be using mobiles than landlines by the end of 2004, India's communications ministry predicts. Around 7% of Indians now use telephones compared to 1% less than a decade ago, and most of that rise is due to the advent of the mobile, officials say. The trend is seen worldwide: mobiles are outstripping landlines as people by-pass often slow state-run firms to sign up for cheaper cellular services. In India, rickshaw drivers and domestic servants are among the new users. "The share of mobile phones in the total number of telephones is ... more than 45%," the Indian authorities said. "It is expected that by the end of the year, the number of mobile phones would be more than the fixed phones." India's mobile telephone sector expanded to 79.4 million customers at the end of May which represented a 39% annual growth. Mobile telephone costs have dropped to as low as one cent a minute - one of the world's lowest rates. Some 1.5 million Indian people are signing up to mobile telephone services every month and the demand has led to the influx of a number of companies into the country.